The Energy Advice Line has joined calls for energy companies to drop their prices after the cost of gas fell to its lowest level in more than a decade. Julian Morgan, managing director of the price comparison, switching and advice service for domestic and business energy users, backed calls by consumer groups for energy companies to be more generous with their price cuts. 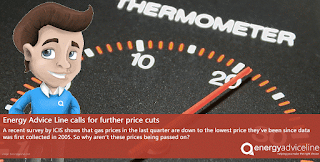 "Wholesale prices are at an historic low, yet suppliers have waited until recently - the end of winter - to make very modest cuts to household gas prices," Mr Morgan said. "These companies can afford to make more significant cuts, and it should have happened sooner, not as we enter a period when most people are, or already have, turned their heating off. "Energy companies talk about rebuilding trust with consumers but they need to do more than reduce prices by a meagre amount very late in the day if they are to win them back." Figures released by price reporting agency ICIS showed that wholesale gas prices in the first quarter of 2016 were down by one third on the same period last year - the lowest since data was first collected in 2005. ICIS analysts said falling prices were due to oversupply in all markets, and suggested prices could drop further, as wholesale gas contracts for delivery in future years were even lower. Consumer groups have called for companies to make further cuts to their standard tariffs following only modest reductions in gas prices earlier this year. The Big Six have offered customers gas price cuts of just 5% and no change to electricity prices, despite energy markets plummeting to historic lows. "Energy companies are not doing the right thing, as they are refusing the pass on reasonable price reductions in line with falling wholesale prices," Mr Morgan said. "It is really important that consumers vote with their feet about this. "Now more than ever it is crucial for consumers to stay informed about what is happening in the market and to demand a better deal from their suppliers. "If supplier refuse to offer competitive prices then consumers need to switch to avoid paying more than they need to. With help from a reputable independent service like Energy Advice Line this can be quick and easy and most importantly completely free." 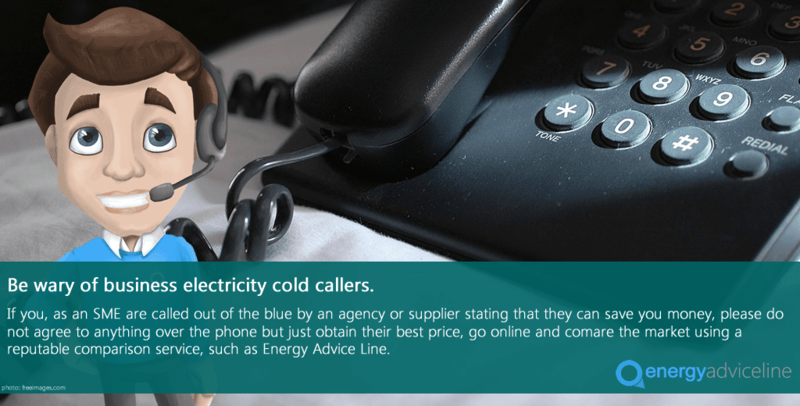 Energy Advice Line is one of the UK's leading price comparison and switching services for business and domestic energy customers. It is also an advocate for energy market reform and has campaigned for a better deal for energy users, including calling for a ban on cold calling and changes to regulations to make it easier for all consumers to switch suppliers. Energy companies and Ofgem should further simplify bills following a new survey showing 60% of consumers are still confused by them, according to the Energy Advice Line. Julian Morgan, managing director of the price comparison, switching and advice service for energy users said the information provided to consumers about gas and electricity supplies needed to be clearer. 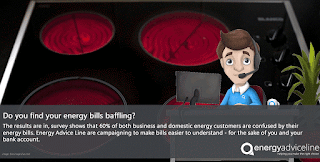 "This survey simply confirms what we already knew - consumers still find their energy bills baffling and this stands in their way of switching suppliers, because they can't compare tariffs like for life," Mr Morgan said. "It's in the interest of energy companies to have complicated bills, which is why the energy regulator needs to step in and impose new rules so suppliers make the information they send out clear and simple. "Previous measures put in place by Ofgem clearly haven't worked, and they need to go back to the drawing board." Ofgem's previous reforms included a requirement for suppliers to provide details of the cheapest available tariff on customers' bills, yet almost half of those surveyed said they have seen no difference. More than half are unable to recall information about cheaper deals. However, more than a quarter of those surveyed admitted they don't bother to check any details on their energy bills beyond the amount they have to pay. Younger consumers are the most ignorant; almost seven in ten of those aged between 18 - 35 admit they don't fully understand their bills. Energy suppliers were voted the worst offenders for sending confusing bills, worse than water companies, mortgage lenders, councils, phone companies and credit card lenders. "The complicated nature of energy bills is obviously a problem that has to be tackled," Mr Morgan said. "It is unacceptable that consumers are still baffled by these bills, when energy now forms a significant proportion of household expenditure. How can energy users take control of their energy supplies and make informed choices about which supplier and tariff to go for, when they are bewildered by the information on their bills?" But Mr Morgan said there was also a role for consumers to play. "Energy users need to do themselves - and their bank balances - a big favour and actually read their bills carefully. We understand that this won't be the highlight of their day, but it needs to be done to avoid paying over the odds for gas and electricity. "This is where the Energy Advice Line can help. Consumers who don't understand their bills, and would like to switch suppliers, can call us free of charge for help. "We can explain the bill, search the market for the cheapest deal and arrange the switch accordingly, and it will cost nothing. It makes much more sense than remaining baffled, or worse, not opening your bill at all." Small and medium-sized firms are losing out on millions of pounds in potential savings by failing to engage with the energy market, according to the Energy Advice Line. Julian Morgan, managing director of the price comparison, switching and advice service for energy users, said a new YouGov survey showed that SMEs who did not negotiate with suppliers were paying a high financial cost. 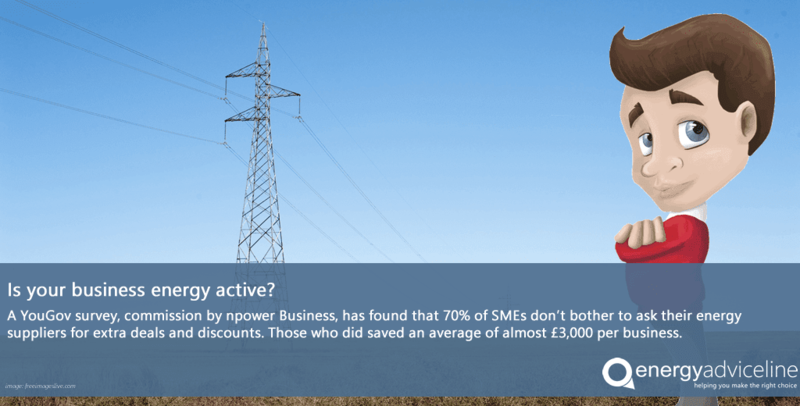 The survey, commission by npower Business, found that 70% of SMEs surveyed don't bother to ask suppliers for discounts and price savings. 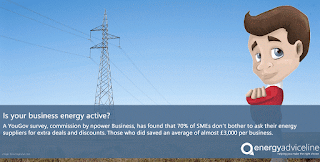 Those SMEs who did ask saved a total of £511 million on their energy bills - an average £2,800 per business. "So many businesses assume there is nothing they can do about the size of their energy bills because prices are beyond their control. It simply isn't true," Mr Morgan said. "Just as shopping around for the cheapest deals can achieve substantial savings, so can negotiating to secure the very best deals. "The sruvey proves that the size of the potential savings is staggering - up to £10,000 for some businesses. "The lesson is that businesses have to take charge of their energy supplies by shopping around and trying to drive a hard bargain. Energy is exactly the same as any other good or service - you don't settle for any old deal." To encourage more businesses to negotiate with their suppliers, the Big Six has launched a campaign that offers tips on how to get the most out of their negotiations, including the importance of research and planning ahead. But Mr Morgan said that using an independent and respected service like the Energy Advice Line was another option for business leaders and decision makers who wanted to save time and legwork. "Businesses can really improve their bottom line by taking a good hard look at their energy costs and suppliers - and we can help with that," Mr Morgan said. "We have expert business energy advisers who know all the traps, tricks and pitfalls involved in analyzing the market and choosing the best deal. "The service is completely free and involves no pressure or cold calling. It just makes financial sense." The Energy Advice Line is one of the UK's leading price comparison and switching services for business and domestic customers. It is also an advocate for energy market reform and has campaigned for a better deal for energy users, including calling for a ban on cold calling and changes to regulations to make it easier for all consumers to switch suppliers. 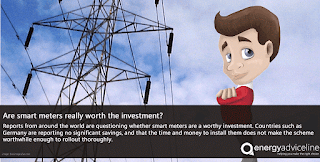 Smart meters: worth the money? The Energy Advice Line has questioned whether a new metering system about to be installed in millions of home and businesses will be cost-effective. Julian Morgan, managing director of the price comparison, switching and advice service for energy users, said the technology had been rejected by Germany and found not to be financially worthwhile in other parts of the world. "We are also very concerned that the technology might discourage consumers from switching suppliers, as the meters installed by one supplier might not be able to 'speak' to another," Mr Morgan said. "At the very least, suppliers and regulators need to ensure that the next generation of smart meters is designed to encourage, not discourage, consumers to switch to save money on their bills." 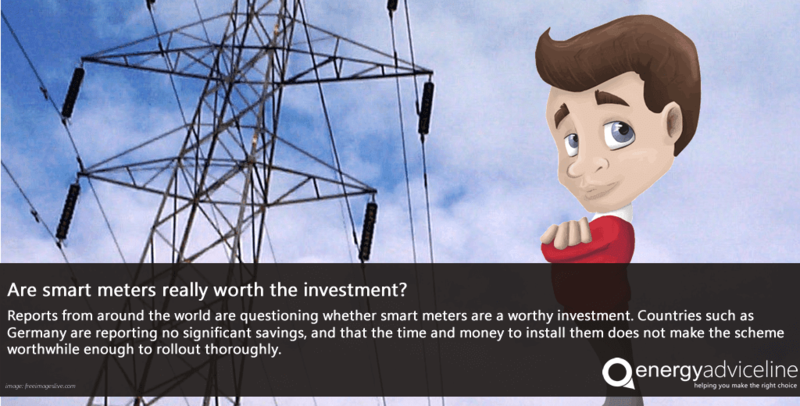 Smart meters send information on energy usage directly to the energy supplier, eliminating the need for meter readings. The technology also allows consumers to see how much energy they are using in real time, enabling them to adjust their usage accordingly. Although the EU has ordered all members to introduce the technology by 2020, as long as there is a positive financial case to do so, not all countries see any financial benefit. Germany has rejected the system, arguing the cost to consumers of installing the equipment would outweigh any potential saving on their bills. Auditors in Australia and Canada have also found the systems too expensive. However, some consumers who already have smart meters say that seeing the real cost of using appliances has encouraged them to adjust the way they use energy - by using the microwave more than the oven for example - which has saved them money on bills. The government says this kind of behaviour could reduce households energy bills by an average £26 a year up to 2020. "While some consumers who already have the first wave of the technology installed have seen some benefits, there have also been problems," Mr Morgan said. "We are calling on Ofgem and the big six suppliers to ensure that the second wave of these meters deliver the promised benefits. "The total cost of introducing this technology into 53 million homes and small businesses is estimated at £11 billion - and suppliers have admitted that at least part of this cost will be passed on to consumers. "It is absolutely essential that the new generation of meters, which is already running late, is fit for purpose. This new system must not increase the financial burden on consumers or place obstacles in the way of them switching suppliers." An unsolicited cold caller has deliberately tricked a Business Electricity customer into a contract by claiming that they were calling from their current supplier, according to Energy Advice Line. The customer was literally bombarded by calls from this cold caller and quoted to Energy Advice Line that she "could not get anything done in between calls" as the frequency was so high. The customer admitted that she was "badgered into submission" and eventually agreed to sign up. Unfortunately, this is where the real issues started for this particular customer as when she contacted the supplier in response to a significant increase on her businesses bills she was told that she had been miss-sold the contract by the agency and the liability did not rest with them as the supplier. The customer was not just tricked into the contract but then found out that the bills had increased as a result. This is unfortunately the big problem with unsolicited cold calling as the customer is literally forced into contracts with high pressure sales techniques with no proof that the caller has checked the market to offer the best price possible. The sheer number of calls that the cold callers make is staggering but is purely designed to wear down the unsuspecting customer into agreeing a contract that is usually very heavily commission weighted.